Every Operator Can Easily Correct "Loop Drift"
Loops must be properly tuned in order to minimize energy usage, maximize product quality, and improve profits. In a plant with hundreds of PID loops, hectic startups and expansions, loop tuning can change and degrade over time. Instrument wear and tear can negatively affect PID loop performance and overall process efficiency. D/3® Loop Optimizer (powered by Control Station) provides a highly intuitive and effective platform for all PID loop tuning on a D/3 system. 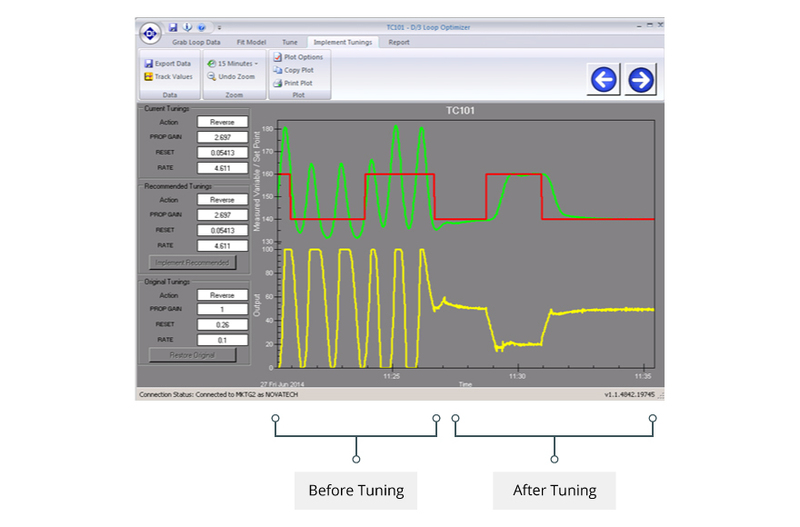 It solves common problems associated with tuning PID control loops and allows users to model, analyze, and tune PID control loops quickly, accurately, and consistently. It’s like having your most experienced loop tuning operator on duty 24 hours a day. D/3 Loop Optimizer employs patent-pending process modeling algorithms that enable users to accurately model non-steady state or noisy process data, and is so intuitive that new users can tune loops as quickly and effectively as operators with many more years of experience. Users model and tune to determine optimal tuning parameters for each aspect of a process operation. For example, a user could easily generate optimal tuning parameters for a reactor at startup, steady state, or shutdown phases. Furthermore, D/3 Loop Optimizer provides tuning capability for multiple simultaneous users from any D/3 Console. Control Station’s patent-pending Non-Steady State (NSS) Modeling technology, D/3 Loop Optimizer is uniquely suited to analyze non-steady state process data collected directly from the D/3. It provides superior PID controller tuning parameters by segmenting process data associated with any/all experiments performed (i.e. bump tests), and by centering the process model over the entire range of process data under review. The adjustable Closed-Loop Time Constant allows users to tailor a controller’s performance. Users can achieve control characteristics from Conservative to Aggressive via the intuitive slider bar control. D/3 Loop Optimizer enhances accuracy and understanding through dynamic stability analysis. Tabular statistics and graphical performance charts reveal the relative improvement to the selected control strategy through statistics such as: Settling Time, Percent Overshoot, Decay Ratio, and Controller Output Travel. Advanced robustness analysis algorithms are used to calculate process stability. Dynamic simulation of the PID controller’s response curve permits users to evaluate proposed tuning parameters before implementing them in the PCM. In particular, users benefit from a side-by-side comparison of existing vs. proposed tuning parameters including optional controller settings such as P-only, PI, PID, and PID with Filter. D/3 Loop Optimizer provides comprehensive documentation of the decision-making process and presents appropriate information in an easy-to-follow report. Each report includes the process data used, an associated model fit, simulated PID response, performance statistics, related stability analysis, model parameters, related data properties, and controller scaling values. Control Station has announced the latest release of its D/3® Loop Optimizer product – a highly intuitive PID modeling and tuning software solution that integrates seamlessly with the NovaTech D/3 DCS. New capabilities within the D/3 Loop Optimizer include advanced statistics and the ability to accurately model and tune controllers from all major OEMs. Properly tuned PID control loops are fundamental to the success of any well managed process control strategy. This video describes how D/3 Loop Optimizer properly tunes PID loops in order to minimize energy usage, maximize product quality, and improve corporate profits.